At the end of the day, we all want a spacious bathroom that fits an oversized tub, generous shower, and dual vanity (with room to spare). However, not every home can accommodate all these features. Fortunately, there are plenty of design tips to help this key room look and feel bigger without breaking the budget! So, whether you need to redo your master en suite or add on a guest bath, try some of these pro tips. Don’t forget to call in our team to help you achieve truly wow-worthy results. There’s a reason you see white in so many bathrooms today. It’s the easiest way to create the illusion of space when you literally can’t find anymore square footage! Interior designers are fond of layering different tones and textures all within this fresh color palette. So you may see white subway tiles offset by a bright white trim and antique-white finished vanity. Still, if that’s not your thing, you can achieve a similar effect by using variations of other light, neutral tones. Misty gray is pretty popular right now. But creams, light beiges and paint with just a hint of yellow, green, or blue will also work. Just remember to echo this color in your countertops, tiles, wallpaper, and other decorating decisions you have to make. The effect should give you a bright, airy space without having to knock down any walls or create an addition of some sort. To keep your bathroom functional, you obviously need a place to store your towels, makeup, cleaning products, etc.! How you incorporate storage, though, can either make the room appear larger or smaller. 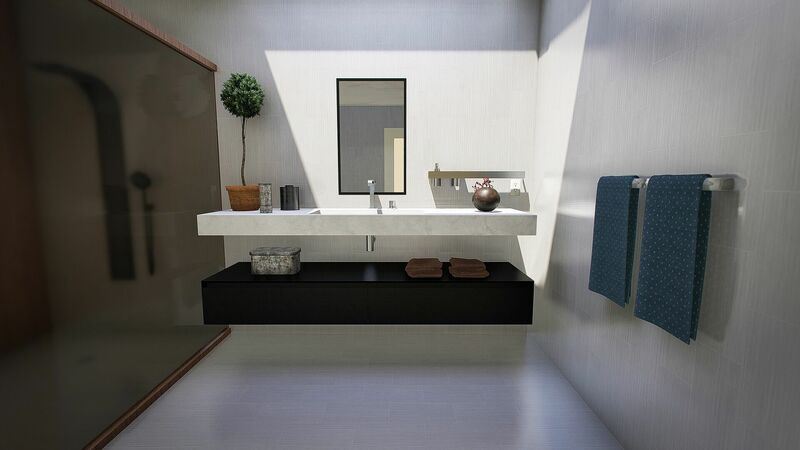 Create the illusion of space with a slightly smaller vanity whenever possible. (You can still get your two sinks—just minimize the depth and don’t go for the largest version available.). Floating shelves, including floating vanities, are also great for making a small room appear larger. By mounting your vanity several inches above the floor line, you’re moving your sight lines up and giving yourself slightly more space for your feet. It sounds like a small detail, but you’d be surprised how much our clients love it! Whether it’s a series of windows to let in natural light or enclosing your shower (and tub) with glass walls, these options will make your bathroom look more open. If you’re concerned about maintaining some privacy, you can always use frosted/tinted glass (especially for the shower door). Some designers will even add faux windows with backlighting to create the illusion of natural light without the exposure. Just be strategic about placement, so you still have wall storage. Don’t underestimate the power of mirrors either! This is the easiest trick to make your bathroom nearly double in size. Consider using unframed versions that blend in seamlessly with the wall. You won’t be able to tell where the mirror(s) end and your actual wall begins! No matter what square footage your current bathroom has, following these simple tips will make it appear larger. It’s amazing how the right design elements can completely transform a small space. If you want to do a full renovation, give us a call! We’re more than fencing and decking. We can help you install new tile, new fixtures, even a new tub! And we’ll happily incorporate some of these changes to show off your new bathroom to good advantage.